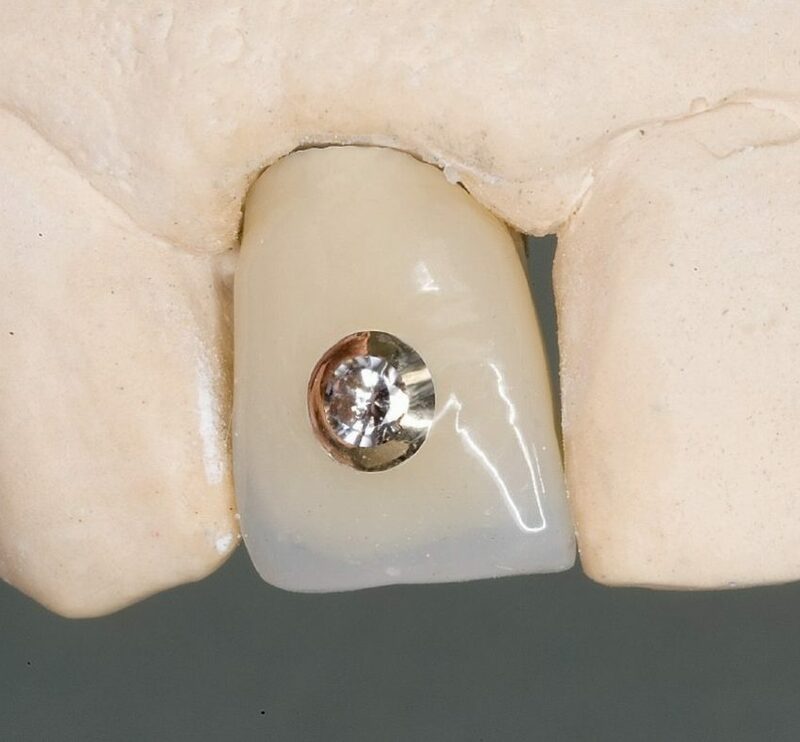 Master dental technician Ulrich Heker describes the unusual process of adding a diamond insert into dental crown. When I received a query from a longstanding dentist client for an upper front tooth crown, the first thought was, no problem! There was, however, a twist. Could we incorporate a diamond, which the patient had inherited from his mother, as he did not wear rings? Furthermore, the patient had a very clear idea of the final appearance of the crown and had even made a design to show exactly where the stone should sit on the crown. I could not refuse the challenge! A 70-year-old male patient referred himself to our practice for the restoration of a missing upper lateral incisor. The clinical examination showed the residual tooth structure of the fractured upper lateral incisor had a horizontal fracture line at the gingival level. Radiological examination revealed the presence of a root filling with no apparent periapical pathology. 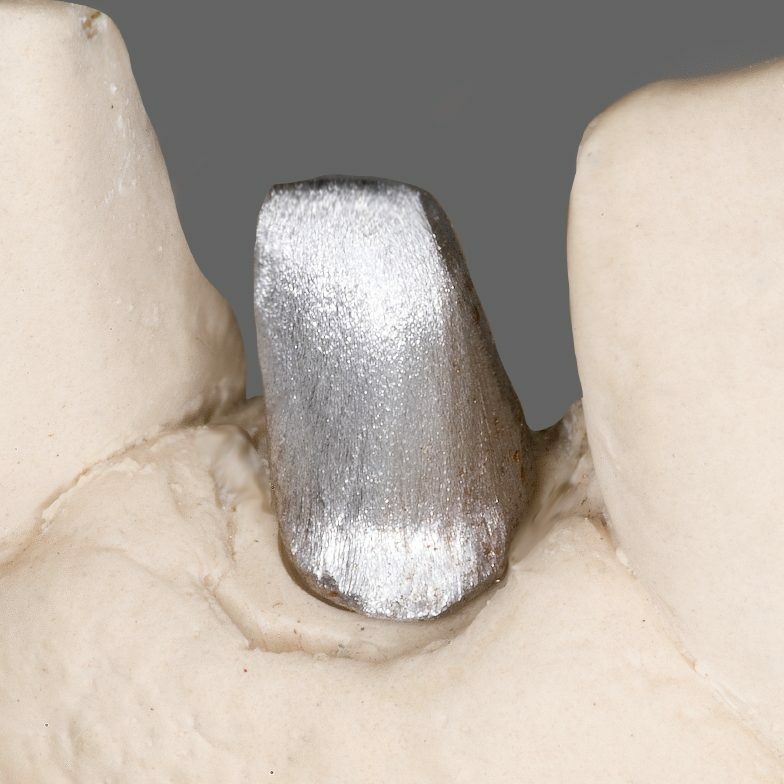 Although the patient came into the practice with a clear idea of having this tooth removed and replaced by an implant-supported crown, after discussing the matter, he agreed to have the tooth restored by a conventional crown, supported by post and core. He also had a special request: to incorporate the diamond gemstone from his late mother’s ring. There was a question about the mount. For example, with a Tiffany mount of a diamond solitaire, the jewel is held by six claws, a form of chaton mount. However, chatons normally used in jewelery making would not be suitable here owing to the sharp edges of their claws and the difficulty in fixing to the piece; the danger of injury and impaction would be too great. Conversations with the jeweler determined that the labial surface of the crown should be a solid, circular gold plate. 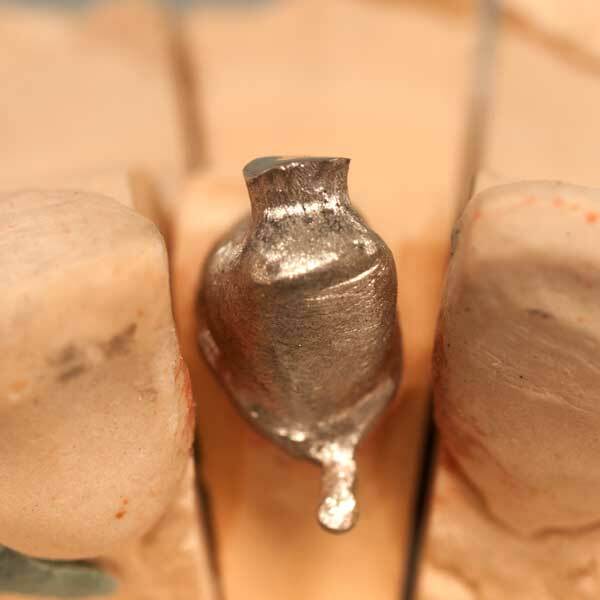 After casting, a hollow matching the base of the gem would be drilled to accommodate the diamond – without perforating the crown. As adhesives cannot be guaranteed to give a long-lasting hold in the damp environment of the mouth, the diamond would be held in place by moulding the edges of the gold plate into an annulus around the top of the stone.The dentist originally wanted to use a ceramic mount. On discussion, we decided this was too risky a strategy. Whilst a genuine diamond could have survived the firing temperature of approximately 950°C undamaged, the impact of the riveting hammer during the setting of the stone was likely to damage the finished ceramic. We therefore chose a composite shading. This would enable us to mould the crown after setting the stone in order to exclude any mechanical damage. After consultation with the jeweler, we decided to use a ductile alloy for the plate, containing as much gold as possible. The post was prepared on receipt of the casts. In this position, the construction of the post was very convenient. Had it been a vital tooth we might possibly have had problems with positioning. Here we were guaranteed the optimal amount of available space for the construction of the crown, together with its recessed stone. The first step was the preparation of a ‘wax up’, in order to establish the outer shape of the tooth. This ‘wax up’ was then further reduced so that only a circular portion of the exterior surface remained where the stone was to be set. The diameter was approximately two mm larger than the stone. After casting and subsequent preparation, the gold plate was again checked for its axial and labial alignment.